Catholic News World : #BreakingNews Update on Relations with China "...formal Agreement between the two does not seem imminent." #BreakingNews Update on Relations with China "...formal Agreement between the two does not seem imminent." Although a number of recent signs may indicate that important steps are being made in the Holy See’s dialogue with China, any formal Agreement between the two does not seem imminent. Sergio Centofanti and Fr Bernd Hagenkord, SJ Contacts between representatives of the Holy See and the People's Republic of China have been underway for some time. Their aim is to attempt to resolve problems regarding the Church in that country, in a constructive and non-confrontational way. These problems include, first and foremost, the delicate issue of appointing Bishops. The Church’s approach is a pastoral one that intends initiating a form of cooperation that can be beneficial for all. By no means does it presume to be able to solve all existing problems with the wave of a magic wand. Because there isn’t one. 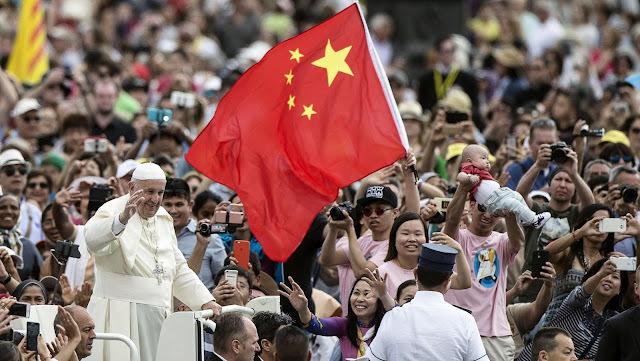 In an interview with Italian newspaper, "La Stampa", Vatican Secretary of State, Cardinal Pietro Parolin, said: "As is well known, with the advent of the 'New China', there have been moments of serious contrast and acute suffering in the life of the Church in that great country. In the 1980’s, however, contacts were initiated between representatives of the Holy See and China. These may have had their ups and downs. But the Holy See has always maintained a pastoral approach, trying to overcome opposition and ensuring it remained open to respectful and constructive dialogue with civil authorities. Pope Benedict XVI represented the spirit of this dialogue well in his 2007 Letter to Chinese Catholics: 'The solution to existing problems cannot be pursued through a permanent conflict with the legitimate civil authorities' (No. 4), he wrote. During the pontificate of Pope Francis, ongoing negotiations continue to move along the line of constructive openness to dialogue and fidelity to the genuine Tradition of the Church". The establishment of a new communist political regime in China was a consequence of Mao Tse Tung’s revolution. Its objective was the liberation of the masses from Western dominion, poverty and ignorance, from the oppression of the old ruling classes, but also from the idea of ​​God and religion. Thus began a particularly difficult historical phase and a time of intense suffering for many Catholic pastors and faithful. Then, in the 1980’s, something started changing in China. Of course, communist ideology is still strong and there have been recent signs of increasing control in areas responsible for security and the regulation of socio-cultural life. But perhaps, this is also an attempt to impose order on an impetuous economic growth. On one hand, this economic boom has produced well-being, new opportunities and initiatives. On the other, it has disturbed the social fabric: the corruption rate has increased, traditional values have been weakened, especially among young people. In this context, ideological rigidity cannot adequately respond to such profound changes which, inevitably, touch the religious sphere as well. The Holy See continues to make itself available, in a climate of respectful dialogue, in an effort to contribute to promoting the good of the Church and of society. Catholic faithful around the world need to understand that this fact concerns them closely: it is not about events happening in a distant country, but about the life and mission of the Church of which we are all members, regardless of where we live. This is the first of a series of in-depth articles on the dialogue between the Holy See and China.